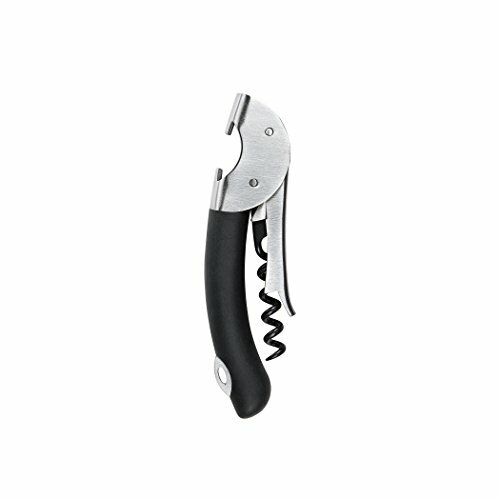 Whether you're a waiter or just like to be prepared, the OXO Steel Double Lever Waiter's Corkscrew is the perfect tool for opening any type of bottle. This Corkscrew opens all cork-topped bottles with ease - the non-stick screw glides smoothly into the cork, then the second lever retracts for easy, no-fuss cork removal. A handy foil cutter folds right out of the handle, always at the ready. A bottle cutter is integrated in the comfortable, non-slip handle, making pop-top bottles as easy to open as corked ones, all in one handy tool. The durable stainless steel provides an elegant feel and the compact size makes it perfect for picnics or travel.